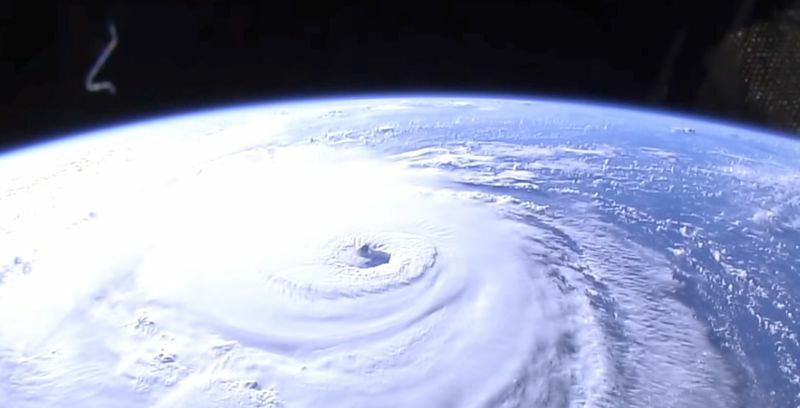 NASA’s “Suomi NPP satellite passed over the eye of powerful Category 4 Hurricane Florence and found the storm over 400 miles in diameter and the capability to generate very heavy rainfall,” according to the agency’s website. The satellite’s “infrared imagery showed” that the eye of Florence is “very distinct,” a sign of a powerful storm. “There has been little change to the cloud top temperatures surrounding the eye overnight. The VIIRS imagery also showed that the overall structure has become slightly more symmetric,” according to NASA. “Florence has a very wide area of storms where cloud tops are colder than that threshold, indicating that the storm has the capability to generate very heavy rainfall over a large area,” the agency also said. The National Hurricane Center (NHC) has warned that Florence could produce 20 to 30 inches of rain in coastal North Carolina, and western and northern North Carolina could see 5 to 10 inches. Isolated downpours could bring as many as 40 inches of rain in some spots, according to NASA. Elsewhere in the Appalachians as well as Mid-Atlantic states could get 3 to 6 inches of rain. The NHC said the storm has 130 mph winds, making it a Category 4, and some forecasters have said the storm could strengthen before it makes landfall. It is moving northwest at 15 mph, according to the last update at 11 a.m. on Sept. 12. Warnings and watches are in effect for the entirety of the North Carolina coast and most of the South Carolina coast. Tropical storm warnings are in effect for parts of southern Virginia. The storm is predicted to also hit Georgia and parts of Alabama. President Donald Trump on Sept. 12 tweeted that residents in Georgia should pay attention to the storm. 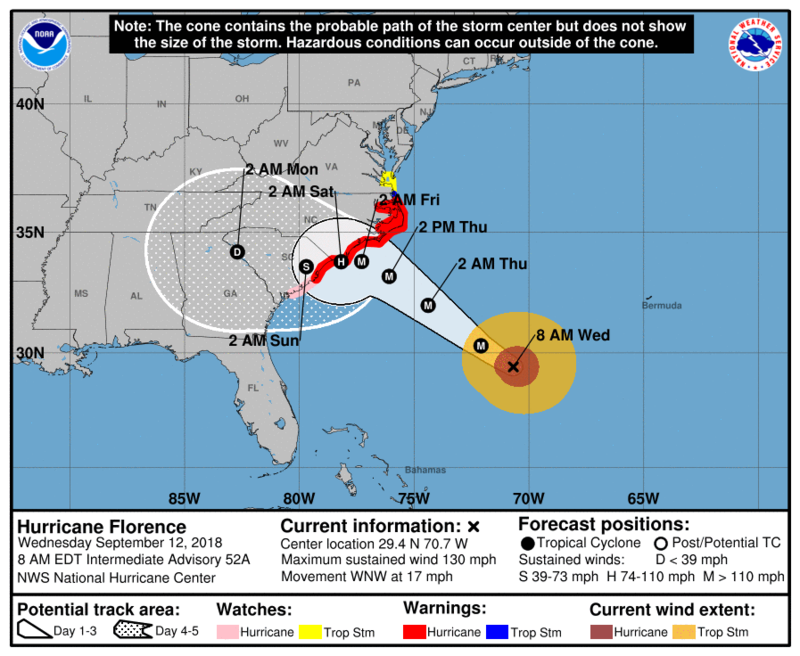 “Hurricane Florence may now be dipping a bit south and hitting a portion of the Great State of Georgia. Be ready, be prepared!” President Donald Trump warned on Sept. 12. “Hurricane Florence is looking even bigger than anticipated. It will be arriving soon. FEMA, First Responders and Law Enforcement are supplied and ready. Be safe!” he also wrote. South Carolina, North Carolina, Virginia, and Maryland have all declared states of emergency. Georgia has not done so. Officials in Georgia have told local media that they are paying close attention to the storm. Florence was first dubbed Tropical Depression Six by the NHC, forming near the western coast of Africa, on Aug. 31. It was later named Tropical Storm Florence the next day as it moved over the eastern Atlantic Ocean. On Sept. 5, Florence became a Category 4 hurricane after it rapidly intensified over about the span of one day. It became weakened and was deemed a tropical storm before it went through rapid intensification over the weekend, becoming a Category 4. Some have forecast that the storm could become a Category 5 storm with wind speeds of 157 mph.